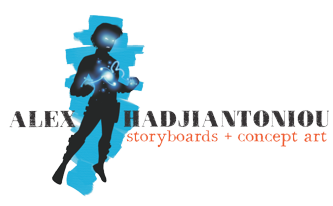 Welcome to my website, my name is Alex Hadjiantoniou and I’m a Toronto based storyboard artist. I hope you’ll stay a while, peruse my artistic portfolio and learn a little more about my background. I do a lot of my work digitally using a tablet and the latest creative software, such as Adobe Photoshop, Illustrator and Corel Painter. Having said that, I still take some time to work with traditional mediums including pen, charcoal, watercolour, marker and acrylic on canvas. If you have any questions or comments please contact me; I’d love to hear from you! I’ll tell you a little about myself here, but if you just can’t get enough Alex, head over to my bio. I was born and raised in Toronto and attended various schools in the area including, Sheridan College in Oakville, Studio M in downtown Toronto, and finally the Ontario College of Art and Design where I attained a Communications and Design Degree (B.Des) in Illustration in 2005. I've been working as a freelance storyboard artist in the Toronto area for over a decade now for various Film Studios and Production Companies and I look forward to broadening my artistic skills and abilities within the fields of Advertising, Film Production, Event and print illustration and concept design.